Selenite has a high vibration, and its primary gifts are cleansing, clearing, and the release of stagnation. It is one of the few crystals that is genuinely self-cleansing, and it is frequently used to cleanse and charge other crystals, as well as areas. In the right situation it can help to restore equilibrium, so although it may be quite ungrounding and over-stimulating for some, many find it calms and soothes to such an extent that it is sometimes even used as an aid for sleep. A small piece of satin spar, such as a tumble stone, can be placed directly on the body to clear stagnation in a specific area. It can be used in meditation, either by holding it or sitting in a ‘stone circle’, to connect with the highest energies; or to clear the mind when making difficult decisions. I recommend small pieces for this purpose. For cleansing and charging other crystals, using the typical spearhead shape of clear selenite, aim the point towards your other crystals and leave for a period of time, preferably overnight. Alternatively, lay the crystals or jewellery on top of a block of selenite or satin spar, or create a small grid of natural satin spar sticks around the crystals. Even keeping crystals in a bowl with a satin spar tumble stone will help to cleanse and recharge them between uses. To cleanse and charge a room, make a grid of satin spar sticks, one in each corner, pointing in towards the centre of the room (there is not an obvious top and bottom to the crystals, so use your best judgement). 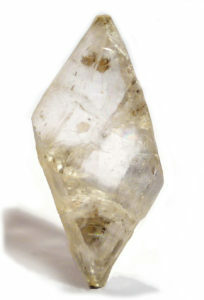 The effect can be further enhanced by activating the grid by connecting the crystals with light (in a clockwise direction), using a control crystal, wand, or channelled energy. Practitioners often have satin spar lamps in their treatment room to keep the energy sparkling and clear. 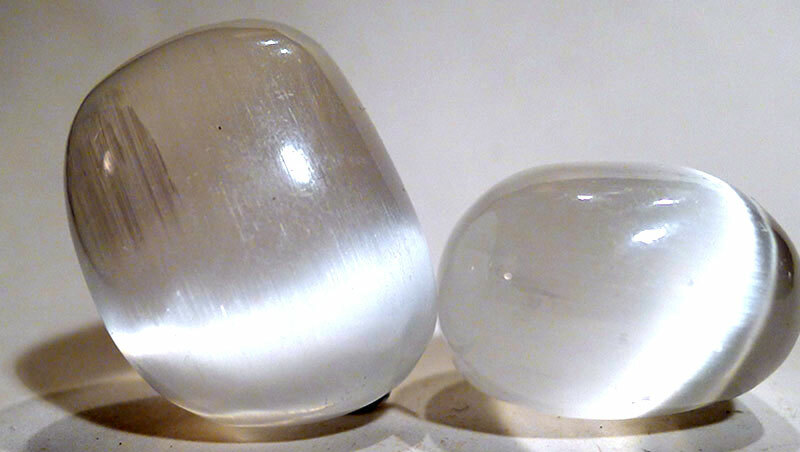 Single selenite crystals can help to eliminate geopathic stress by being aimed from a window towards the source of Shar Chi (“poison arrow” Chi), to redirect the energy, or dissipate its impact on a building. So called “negative ley lines” can be redirected or discharged by placing satin spar sticks or blocks either along the line or across it – experiment to find the optimum direction, as it varies with the situation and cause of the problem. To release energy blocks or held energy from the body, a satin spar wand makes an excellent massage tool. I especially like the variety carved into a spiral shape with a fluorite end cap. Using the fluorite against the skin and rubbing very gently will release the blockage and restore balance, while the satin spar spiral whisks it away from the body and out of the energy field. Selenite, especially satin spar, is very soft and should be handled gently and not carried in a pouch with other crystals, to avoid damage. Also avoid getting it wet. It is a hydrous mineral, meaning that not only does it contain water, but it readily absorbs water if placed in it. If this happens, it will become dull and may even fall apart. On occasion your crystal may need cleaning (as in getting the dust off), in which case, either vacuum it with care, or use a slightly dampened sponge or cloth that has been thoroughly rung out first, to wipe over it. Gypsum is widespread and is found in a number of different forms. Well-developed crystals can be ‘blocky’ with a slanted parallelogram outline, bladed, or occur in other shapes such as ‘ram’s horn’, ‘stag horn’ and ‘fishtale’, named after their appearance. When formed of parallel fibres with a silky lustre it is known as satin spar, and rosette shapes are known as desert rose (along with the denser version formed by baryte, as described in the previous section). Alabaster is gypsum in fine-grained, massive form. Gypsum occurs in massive beds as a result of the evaporation of ocean brine. It can also be the result of alteration of sulphides in ore deposits, as disseminated crystals in sedimentary deposits, and deposits around volcanic fumaroles. The famous White Sands (Missile Range) in central New Mexico, USA is formed of gypsum, and is one of nature’s largest mineral deposits. The Cave of Swords in Mexico is named for its enormous selenite crystals. Gypsum has been important in industry for thousands of years, and is used in mortar, building plaster and plaster of Paris. Because satin spar is soft and easily carved, and also displays an interesting play of light, it is available in a range of created objects including wands, sculptures, palm stones and lamps.